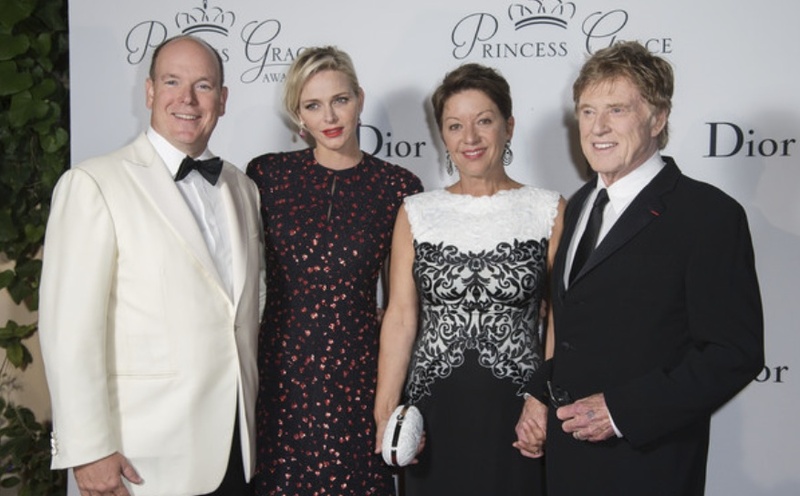 (VIDEO) Prince Albert II and Princess Charlene of Monaco Host an Award Ceremony. On the evening of Saturday, September 5, 2015, Their Serene Highnesses Prince Albert II and Princess Charlene of Monaco hosted the 2015 Princess Grace Awards Gala held at the Palais Princier in Monaco. This is the first time this special award ceremony is being held in beautiful Monaco at the request of Princess Charlene to offer a unique setting to Princess Grace’s legacy. Tonight’s event, sponsored by Christian Dior Couture, will also announce the significant increase in collaboration between the Princess Grace Foundation-USA and the Fondation Princesse Grace de Monaco. The winner of the Prince Rainier III Award went to writer, director, producer, activist, and Oscar winner, Mr. Robert Redford and his wife, Sibylle Szaggars Redford. The couple received the prestigious award for their “…outstanding contributions to the Arts and their exemplary give-back…” according to a press release. Previous (VIDEO) HRH Princess Beatrix of the Netherlands Opens the 2015 provinciale Molendag Zeeland. Next (VIDEO) HM Queen Elizabeth II Attends the 2015 Braemar Gathering.